A guest post by Mike Brennan. That’s a great question because I would never have thought I’d end up here. I’m more of the movies/pop culture/video games type. I don’t like sports, and I even quit on Wii Fit. The first time I was exposed to yoga personally was in a college class back in 1990. Two of my close female friends signed up and encouraged me to check it out. I was skeptical, but I went along with it. Yoga certainly wasn’t as mainstream back then. When the day of the class came, we all grabbed some mats as we entered the gym. The instructor sat in front of the group of us, some 30 people varying in every way imaginable. We were led through some basic stretches and poses and were winding down with some mediation and quiet. The instructor coached us in our breathing, telling us to picture a calm peaceful place. Just as it felt like the group as a whole was entering into stillness, I heard faint sounds of snoring. “Ok,” I thought, “it is relaxing.” And then I heard an unmistakable sound, one that can ruin any time of silence, beaconing our inner child to laugh uncontrollably– the loudest flatulent sound ever. Until more recently, when my wife began her own personal fitness journey. She was watching a transformation happening in a close friend of hers, and it piqued her interest. She began to wonder if she might be able to experience similar changes by adopting some new healthy habits. It’s now been 2 years of daily fitness routines, including workouts and yoga. My wife’s health journey intersected with my own daily habit forming journey, but mine was art related. (Read about my 6 years of consecutive daily art making). In my daily art practice, I was experimenting with various themes and always seemed to come back to the human figure in some way. I didn’t have the time or finances to go to some life drawing classes, so I thought about finding interesting human form poses in photographs. I was already in a daily habit of posting my work on Instagram, so I just started searching for yoga poses. 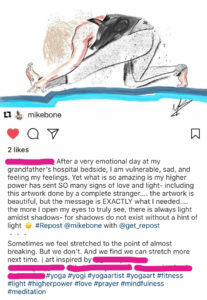 I knew that I was going to create my daily art anyway, and if I was finding inspiration in other’s posts about their fitness journey, why not tag them in the art they helped inspire? It created another layer, one of being able to surprise people, and spread joy and encouragement. And to be honest, that’s a bigger part of why I kept at it. I found this community rising up around my art. The more I used my art to encourage and surprise people, the more the community grew. Every once in a while my art has ushered in an encounter that is especially moving, speaking to people in ways that I could never imagine. And this excites me because it is one of my core values – helping people. I am always looking for ways to love people through my art. To bring a smile. Let them know they are noticed in this busy, noisy world. Tell them their daily practice helped inspire mine. 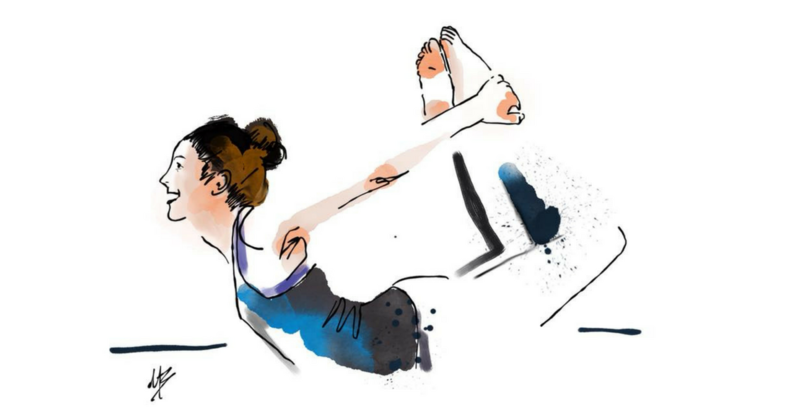 As things grew, I started taking commissions for custom yoga art. People started sharing my work more. My Instagram yoga art posts led to other opportunities as well. Several pieces of my yoga art were recently included in an exhibit called “The Art of Healthy Living” at the I.D.E.A. Museum in Mesa, Arizona. I also have a few pieces of my work available through Galleria Misto, in Belleair Bluffs, Florida. And I’m currently working on my second book, a community effort where I’m matching my yoga art with some stories and profiles from the people who inspired the art. I didn’t want to just create a book of my art, page after page, but rather use it as a platform to invite other people in and lift them up. None of this would have been possible without the yoga community that has influenced my art. Opportunities come out of the connections we make and keep. What could happen if you lean into your community? Something special might be waiting just underneath the surface! Some of his work includes custom “Rockstar” pet portraits, pop culture art, yoga art, live event sketching, original paintings, graphic design, and recently, he authored/illustrated the book “Dear Snow: One Man’s Angry Rant Against Winter”. 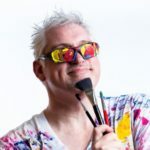 While the media and subject matter may vary, he creates art that shares experiences centered around those themes to form connections with his audience. To see more of his art visit his website.